From its aqua blue shores to its laid back beachy vibes, Byron Bay is a must visit location in Australia. While you are visiting this magical town, why not explore its surrounds? There are some unbelievable day trips right near Byron Bay that you need to check out. From Mullumbimby to Yamba, take a look at the top scenic drives from Byron Bay. Fancy whale watching? Maybe you’d prefer swimming in aqua water? Or, are you an antique lover? No matter what you love doing, Brunswick Heads really has it all. Filled with an array of trendy antique shops, you will be able to peruse stunning boutiques around the area in Brunswick, and who knows... you might find a treasure. 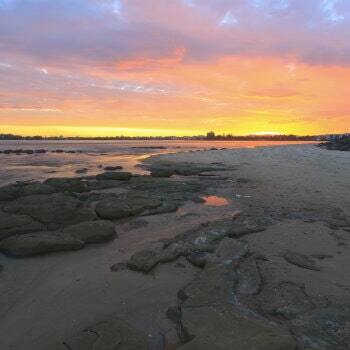 If you’re looking to get in touch with nature, Brunswick Heads Nature Reserve will be the perfect place for you to check out. Popular for whale and dolphin sightings, Brunswick Heads is the best place to spot these magical creatures. If you’re looking for an awesome spot to swim, Simpson Creek is the locals hidden paradise. After your packed day of relaxing and exploring, why not head to the Brunswick Picture House to end your day. Directions: Drive from Skinners Shoot Road and Butler Street to Byron Bay. Take Ewingsdale Road and M1 to Old Pacific Highway in Brunswick Heads. Top Attraction: Antique shops, Brunswick Heads Nature Reserve, whale watching, Simpson Creek, Brunswick Picture House. Situated with the Clarence River to one side and ocean to the other, Yamba is a beachy town that is an essential day trip location. This place is popular and for good reason. From the amazing beaches that line Yamba to the hidden spots locals like to keep secret, ​you’re ought to be impressed. 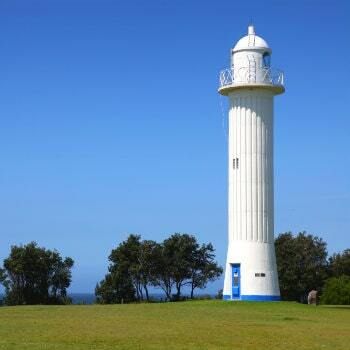 Visit Yamba Lighthouse for sweeping views of the ocean and catch some waves. Yamba is a surfing lover's dream come true​ and you’ll see just why once you get here. For a change of scenery, drive to Yurigir National Park. There is heaps to explore here from coastal walks to swimming. On Wednesday mornings, you can check out the Farmers Market in town as well. If you love fresh seafood, Yamba is the place to be. Sit by the water, eat seafood and watch the sunset to finish your day. Directions: Follow Yamba Road to Pacific Highway/A1 in MacLean. Continue on Pacific Hwy/A1 to Ewingsdale. Take the exit from M1. Take Ewingsdale Road and Shirley Street to Skinners Shoot Road in Skinners Shoot. Top Attraction: Yamba Lighthouse, surfing, Yurigir National Park, Farmers Market. Filled with mind-blowing scenery, Springbrook is a National Park that sits on top of an ancient volcano. Find an array of rare animals and plants right here just under two hours away from Byron Bay. The best places to check out include Lyrebird Ridge Road forest drive, Purling Brook Falls and the Canyon Lookout and Twin Falls Circuit. You can also pack a picnic and relax at the Goomoolahra Picnic Ground. Natural Bridge is a stunning crystal clear waterfall tumbling through the roof of a basalt cave, home to thousands of twinkling fireflies. The great thing about Springbrook National Park is the fact there are so many species of flora and fauna. Not only that, there are impressive canyons and swimming holes to cool down in. Spot rare birds, go hiking, bask in the view and reset in this stunning national park. Directions: Get on M1 in Ewingsdale from Shirley St and Ewingsdale Road. Follow M1 to Somerset Drive in Mudgeeraba. Take exit 82 from M1. 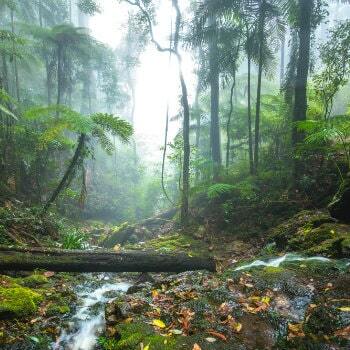 Top Attraction: Lyrebird Ridge Road forest drive, Purling Brook Falls, Goomoolahra Picnic Grounds, Canyon Lookout and Twin Falls Circuit, Natural Bridge. Mullumbimby is a hidden gem, only a 30 minute drive from stunning Byron Bay. Unlike its predecessor, Mullumbimby transports you back to the 70’s in no time. Maybe it’s the laid back locals, artisan farmer's markets or the picturesque scenery you’ll have the pleasure of seeing on your way into town. If you’re looking for a relax day filled with drool worthy food, luxurious wellness spas and epic memories made, you have to visit ‘Mullum’. On your way, check out The Farm. Like its name states, this place is a dreamy farm that has an epic eathouse. Those who visit Byron rave about this place, making it a great first stop. Take the Coolamon Scenic Drive instead of the Pacific Motorway to bask in the amazing scenery this section of New South Wales boasts. From there make sure to check out Crystal Castle and Mount Chincogan. Stroll around the gorgeous streets and check out the amazing farmers markets that people travel all over to see. Directions: Drive from Skinners Shoot Road and Butler Street to Byron Bay. Follow Ewingsdale Road and Myocum Road to Possum Shoot Road in Ewingsdale. Take Coolamon Scenic Drive to Laurel Avenue Mullumbimby. Turn right onto Laurel Avenue. 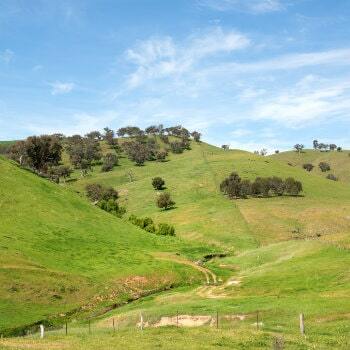 Top Attractions: Coolamon Scenic Drive, Crystal Castle, Mount Chincogan, Farmers Markets. Do you know that you can download this map directly to your phone? Press the box symbol located on the top-right corner of this map to open in your Google Maps app. Now you can easily access this map on your next day trip in Byron Bay.